My recent posts are evidence that I take my self-care seriously. Part of my self-care is to have alone time. Just me, myself and I…that’s all I got in the end! (Cue Beyoncé hair fan) However, it also important to spend time with my boys. 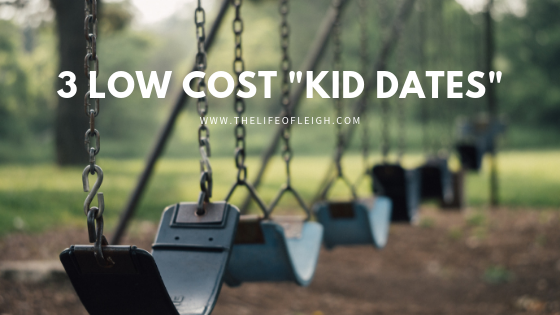 It’s hard to find “kid date” spots that are not a park or super expensive. Here are three places I take my kids that gives my quality time spent with them without breaking the bank! And none of them are the park! We have a membership to Sam’s because it’s conveniently located within miles from our house. But, this can be done at Costco, BJ’s arewhatever big box store you fancy. Theseplaces have the most inexpensive food and drinks. One day after school I picked up my son from school and we went to grab a few things we needed for the house. Before we started shopping, we got a snack. 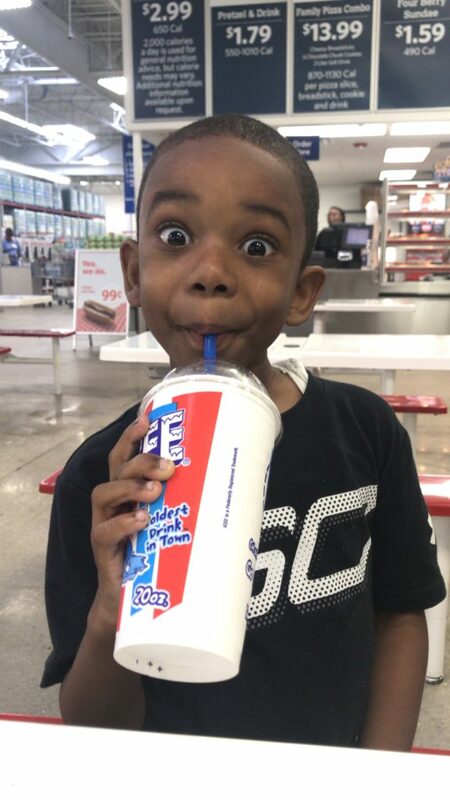 For less than $3 we got a cinnamon pretzel (to share), an icee for him and a (super) large fountain drink for me. We sat down and talked about his day what he learned at school, etc. It was a small price to pay for some 1:1 QT with my lil man. That face says it all! He was surprised by our after school snack date. My kids think they are drinking coffee. Don’t tell them, but I order a short white hot chocolate at kid’s temperature. It comes in a cute little Starbucks cup. You can’t tell them anything! These Starbucks dates started about a year ago. 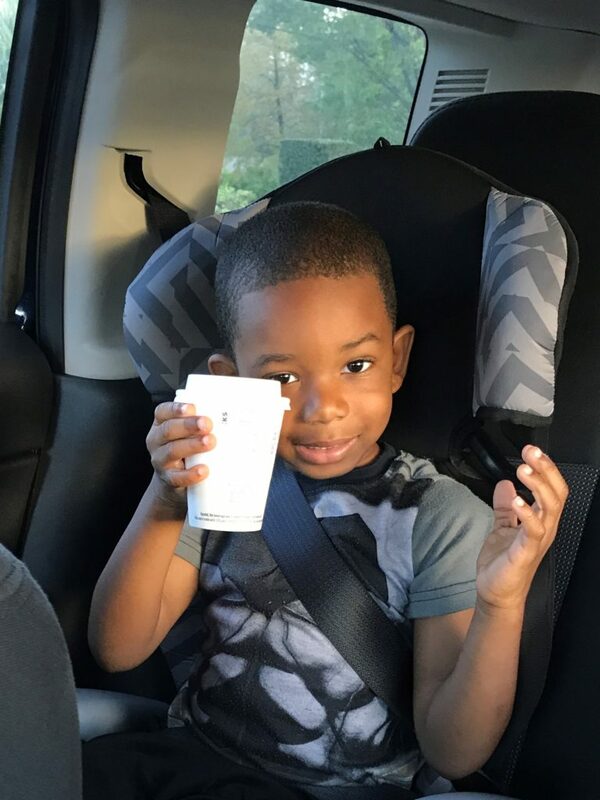 Coffee dates were a treat for good behavior all week in school. He feels so grown up with his little coffee cup. The kids hot chocolates are cheap! So, for less than $10, you’ve got yourself a cheap date. Cheers to the cute little Starbucks cup! Yes, Pizza Hut can be a cheap date…if you go during the week. Some locations offer a lunchbuffet Monday-Friday for…$5. You read itright. Pizza, pasta, breadsticks andsalad for $5! Now, there are no specialrequests. You get whatever they areserving. But the selection never disappoints. 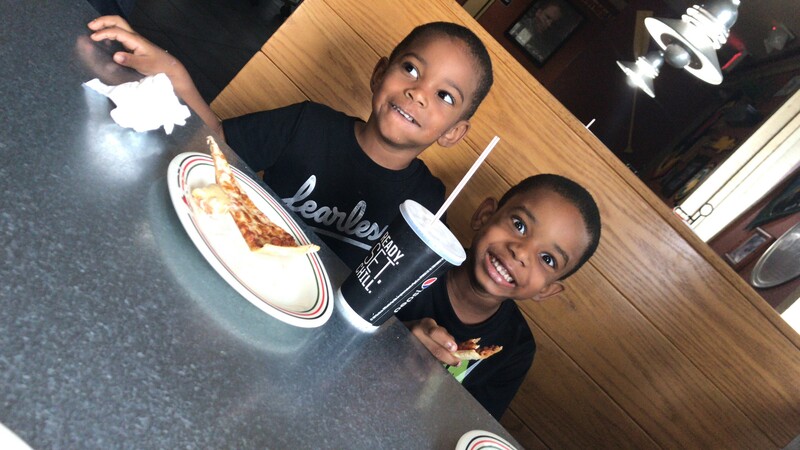 My hungry men are always satisfied! We have these dates with our kids on holidays when school is closed. Or, on doctor appointment days. All of my kid date spots revolve around food. That’s not by coincidence. Spending time with your kids doesn’t always have to be a ploy to get them tired. Take time to sit with your kids, break bread and talk. Get to know them. One day my kids may not want to go eat pizza with mom and dad. But now, they’d love nothing more. I am cherishing every one of those moments while I still have them! And gaining a few pounds along the way! What are some of your favorite places to take your kids? Love these – especially when it gets too cold for the park!